Hanukkah - The Holiday of Lights - Why do we celebrate? Hanukkah, also said to be Chanukah and Hannukah, is the Festival of Lights, celebrated by the Jewish people in the month of December. It is celebrated as a holiday in the memory of a miracle that occurred as only one day’s worth of oil for lighting the Menorah lasted for eight full nights, when the Maccabees liberated the Holy Temple in Jerusalem. Greeted as a tradition, it is based on the story of the Jewish people’s defeat of the Seleucid Empire (Syrian-Greeks) in the Holy Land. In the 2nd century BC (165) a small army of Jews called the “Maccabees” staged a rebellion against the Seleucids during their attempts to Hellenize the Jewish people and Land of Israel. The word Hanukkah signifies “dedication” and alludes to the rededication and freedom of the Promised People's Holy Temple and worshipping center of God. Consequently the tradition came into being of eight days and nights, every night amid the occasion one additional light is lit celebrating and recalling the dedication of the Jewish people and God’s deliverance from their adversaries. Today, celebrations include eating potatoes pancakes, latkes and doughnuts, as they are cooked in oil. 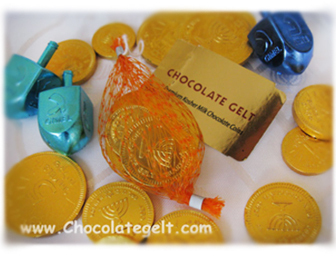 Children usually light the candles (you can find inexpensive traditional Chanukah candles made in Israel at Chocolategelt.com) and sing traditional tunes (and the box of candles has a song with lyrics printed too! 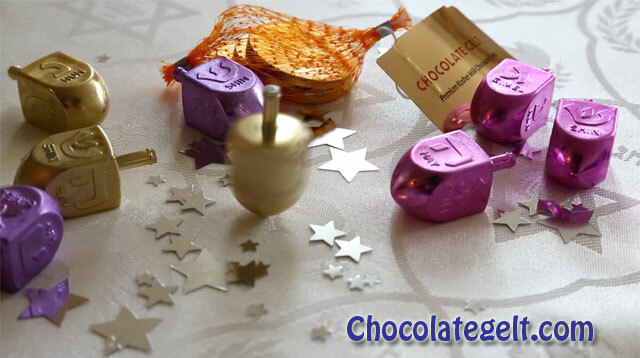 ), playing with the “dreidel” a spinning top with Hebrew letters with the acronym of “a great miracle happened there”. Any time you want to spin a dreidel, you can find one (or one hundred) here: Chanukah Dreidels of all Varieties, wood and plastic, large and small, individual and in bulk. While the occasion is considered minor in Jewish custom, in Israel the occasion is a period of solidarity and functions are held all through the country.